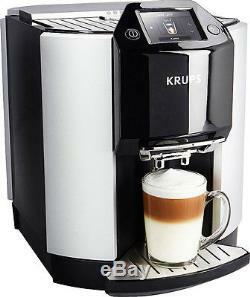 Krups EA 9010 One-Touch automatic Espresso Cappuccino coffee machine maker. 17 hot drinks in one machine at the touch of a button Nine black cups (including Espresso, Doppio and American) and eight white cups (including Latté, Cappuccino, and Flat white). Full automation from start to finish One-touch system with automatic drink parameters and automatic rinsing of the steam nozzle Intuitive user interface 100% frontal operation for direct access to key functions and compact design Full colour touch screen with visual, step-by-step instructions. Full customisation Up to eight user profiles each hold up to eight favourite recipes (64 recipes in total) Customisable drink parameters (temperature, volume and strength). Ease of maintenance Easy, onscreen maintenance guide Removable drip tray with automatic level alert Bean container and water tank sensors to indicate when empty/full Rinsing and de-scaling alerts. Technical specification Metal conical burr grinder for precise and uniform grinding Patented Compact Thermoblock System for rapid heating 15 bar pump pressure for the perfect aroma and flavour extraction Height adjustable coffee dispenser suits a variety of cup sizes 1.7l water reservoir 280g airtight bean hopper (machine also suitable for use with ground coffee) Cup/drip tray illumination Programmable water hardness Programmable power shut-off times Included: 1 x Claris Aqua Filter System cartridge; 2 x cleaning tablets; 2 x steam nozzle cleaning agent; 1 x de-scaling powder; 2 x Cappuccino/Latte cups KRUPS International Limited Guarantee (2 years) Dimensions: 57.5L x 37.5W x 45.4H (cm). Combining technology and ease of use. Coffee connoisseurs can recreate the authentic, barista-made taste of their travels at home with 17 cafe-quality hot drinks. Full automation from start to finish. 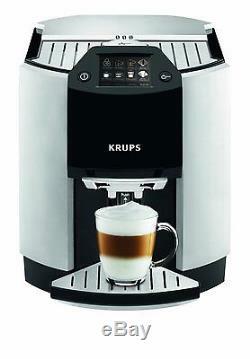 One-touch system with automatic drink parameters and automatic rinsing of the steam nozzle. Full colour touch screen with visual, step-by-step instructions. Some items might come with a default language in German you will have to go in the menu and select the language you need or change on start-up. Electric items come with 2 round pin Europe style plugs, we will include an adapter depending on the destination country. Counties with strict custom rules and regulations like: Russia, Vietnam, Ukraine, Kazakhstan, Brazil, Chile, Uruguay, Israel, etc, may take longer due to strict custom rules and regulations, not couriers delay. We cannot control on know about this delay in advance. Clients must check their packages before accepting and signing for them. We cannot calculate this cost for you in advance. Unfortunately we cannot know the rules, regulations or practices for each country. Please check the package before receiving the item. Items that are sent back should be sent with original packing and all accessories included in the package received. We try to maintain high standards of excellence. Eedback is very important to us. We cannot resolve any issue, if we do not know about it! 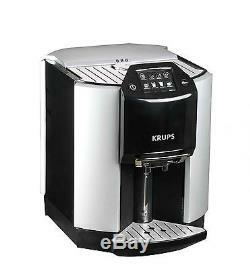 The item "Krups EA 9010 One-Touch automatic Espresso Cappuccino coffee machine maker" is in sale since Friday, November 17, 2017. This item is in the category "Home & Garden\Kitchen, Dining & Bar\Small Kitchen Appliances\Coffee, Tea & Espresso Makers\Espresso & Cappuccino Machines". The seller is "kyriacosd123" and is located in SHIPPING FROM EUROPE. This item can be shipped worldwide.